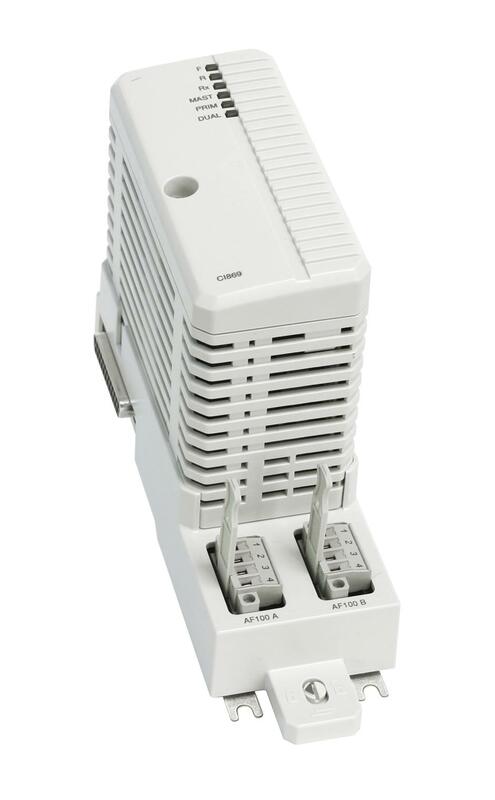 The CI869 is an AC 800M communication interface that connects to the AF 100 field bus through the twisted pair (TWP). The CI869 expansion unit contains the CEX-Bus logic, a communication unit, and a DC/DC converter that supplies the required voltage from +24 V supply through the CEX-Bus. The CI869 can be configured for both redundant cables and redundant communication interfaces. The CI869 communication interface attached to the AC 800M controller provides connectivity to other AC 800M, AC 160 or a connectivity server over AF 100. An AC 800M controller with the communication interface CI869 behaves as an AF 100 station, receiving data from other AF 100 stations/devices. The CI869 has integrated twisted pair modems. CI869 can also be used in an AC 800M High Integrity system. The AC 100 OPC Server runs in the Connectivity Server and requires the AF 100 hardware interface CI527A installed in the same node as the AC 100 OPC Server. In the other end you use the CI869 to connect to the AC 800M controller network. Advant Fieldbus 100 redundancy is supported by using two CI869s.